This is old version HellFire: The Summoning 5.4 apk for Android, you can install it if you want to downgrade or install old app. It is top Adventure apps from DeNA Corp..
You need to seal of the dimensional rifts before there is no peaceful land left to protect. The gameplay involves elemental power such as Fire, Water, Earth, and Death. Build your strongest deck consist of mythical creatures, dragons, and deadly beasts. 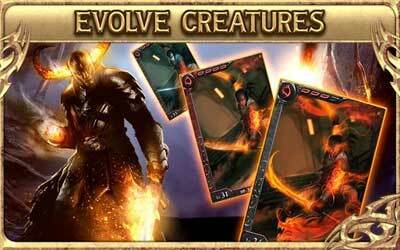 You can even summon and evolve the creature of your deck when you battle with hordes of hellish creature. To make the player feel exciting playing the game, it incorporates incredible graphic. The cards on your deck are definitely a works of art. When playing HellFire: the Summoning, you will find it is easy to control. Since each card has its own skill, you will be able to create a team consists of skillful cards. It features quest that you can solve. Dynamic live event is also available to make it feels more realistic. Playing this exciting game is one way to spend your boring time. HellFire: the Summoning for Android is developed for player who likes challenges and adventures. New Cursed missions! now Special Dungeon and Raid Boss Events are going to be even more exciting and challenging!